The artist, Deerfield, Massachusetts; his estate until 1911; his daughter, Agnes Gordon Fuller Tack [Mrs. Augustus Vincent Tack], Deerfield, Massachusetts; gift 1953 to NGA. Letter of 24 January 1992 from Jeffrey Goodhue Legler, great-great-grandson of the artist (in NGA curatorial files) provides provenance information. Probably Memorial Exhibition of the Works of George Fuller, Museum of Fine Arts, Boston, 1884, no. 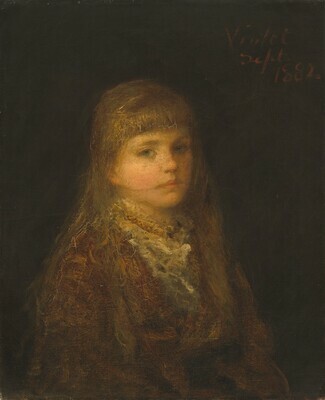 161, as Portrait of a Girl. Works by George Fuller, Reichard & Co., New York, 1887, no. 6. Centennial Exhibition of the Works of George Fuller, The Metropolitan Museum of Art, New York, 1923, no. 20, as Portrait "The Artist's Daughter". The support is a relatively fine, plain-weave fabric mounted on the original four-member, mortise-and-tenon stretcher (possibly constructed by the artist himself). The painting remains unlined and the tacking margins are intact. The white ground, smooth and even, has been covered in some areas by a second, red ground. Subsequent brushwork is rich, fluid, and complex. In the dress, for example, a thin wash of dark paint was wiped over the dried lighter layer below, and the sitter's right sleeve was intentionally abraded to reveal underlying blue-green paint. The face is more thickly painted; its surface was textured by scratching the wet paint with the point of a brush handle. There are very wide drying cracks, particularly in the area of the head. The thick varnish is uneven and has discolored. Homer, William Innes, and David M. Robb. "Paintings by George Fuller in American Museums and Public Collections." The Art Quarterly 24 (Autumn 1961): 294. American Paintings and Sculpture: An Illustrated Catalogue. National Gallery of Art, Washington, 1970: 62, repro. American Paintings: An Illustrated Catalogue. National Gallery of Art, Washington, 1980: 165, repro. American Paintings: An Illustrated Catalogue. National Gallery of Art, Washington, 1992: 186, repro. Kelly, Franklin, with Nicolai Cikovsky, Jr., Deborah Chotner, and John Davis. American Paintings of the Nineteenth Century, Part I. The Collections of the National Gallery of Art Systematic Catalogue. Washington, D.C., 1996: 241-243, repro.